A powerful and comprehensive audio router, capable of providing the extensive routing requirements demanded for today’s broadcast and production facilities. With the ability to route 4096 inputs to 4096 outputs (over 16 million crosspoints) the Nexus Star is designed to be implemented as the core of a larger Nexus installation, networking up to 31 Nexus Base Devices. 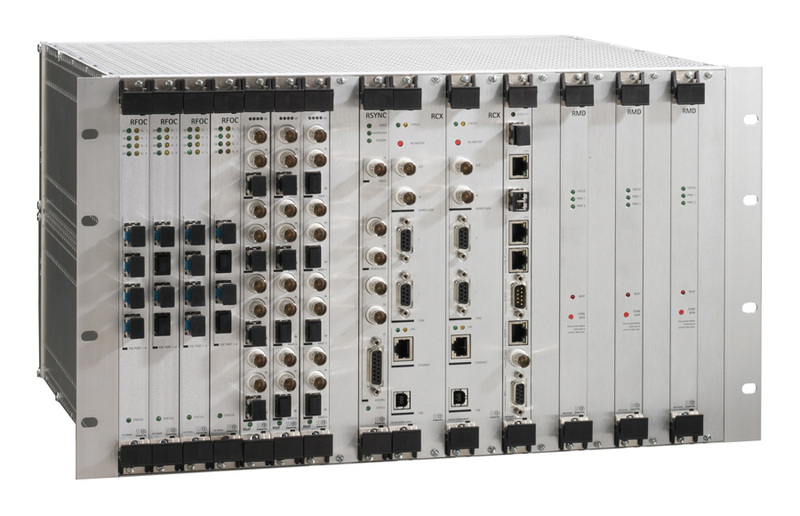 The 6U 19” rack-mounting unit comprises I/O boards for connection to Nexus Base Devices and external MADI equipment, a wide range of synchronisation options and redundant power-supply units. The Stagetec Nexus Star is a modular system, comprising 6U 19” rack-mounting chassis loaded with audio, control and processing cards as required. Referred to as the Nexus Star Base Device it provides 21 card slots allowing up to 16 interface boards and 2 main controller boards to be fitted. DSP cards can also be fitted to make this the processor and routing core for Stagetec Aurus or Crescendo mixing consoles. Designed for use in extensively networked systems, the optimised routing matrix acts as the network core, managing routing functions across an entire facility. Capable of routing to a maximum of 31 Nexus Base Devices, the Nexus Star is able to route 4096 inputs to 4096 outputs (over 16 million crosspoints). Implementation of the Nexus Star is therefore ideal when networks become large, complex and spread across multiple locations. A minimum of 1 RCX controller board is required for every Nexus Star Base Device. Integrating the main CPU and audio routing matrix, the RCX provides all control, monitoring and routing functions. For redundancy, a second RCX board may also be fitted. The redundant RCX board remains in ‘hot standby mode’ until required, with switchover being forced either manually or under program control. The RCX board is fitted with ETHERNET, USB and two RS-232/RS-422 communications ports, allowing communication with external equipment for the purpose of system management and monitoring. Synchronisation ports on the RCX are provided as wordclock ‘in’ and ‘out’. As standard, Nexus Star can synchronise to its internal sync source, wordclock, any optical input – including inputs from connected Nexus Base Devices and MADI if fitted. Installing the optional RSYNC Synchronisation board additionally allows the Nexus Star to synchronise to video Black Burst, AES3 or a separate wordclock reference signal. The RFOC (Router Fibre Optic Connection) board is the interface that links the Nexus Star to Nexus Base Devices throughout the networked system. A single board provides four independent duplex connections enabling a total of 256 I/O channels, control and sync data to be passed over optical fibre (negating the need for any additional cabling). The RMF (Router MADI Format) board, fitted with 4 x 64-channel MADI ports, allows simultaneous transmission of up to 256 inputs and 256 outputs. Each card has BNC connectors and may also be fitted with optional fibre optic LC interfaces for ease of connection to any external digital audio workstation, MADI equipped audio console or communication system such as the Delec Oratis. All interface boards are certified by Dolby® to be bit-accurate and transparent to Dolby E.
Redundancy and reliability are key features within Nexus Star. A maximum of three back-up power supplies (no fans) can be mounted in the rear. Fibre optic links between Nexus Star and Base Devices can be mirrored. Nexus Star cards are all hot-swappable and come on-line within a few seconds of installation. An internal software monitoring system immediately detects any errors or failures in the Nexus network and reports the details to all connected control PCs or systems. Nexus Star also has a powerful embedded control system called Logic, that manages internal Nexus Star functions or controls external systems. Nexus Logic operates independently of any computer and can be easily configured to provide complex customised control functions or messaging.